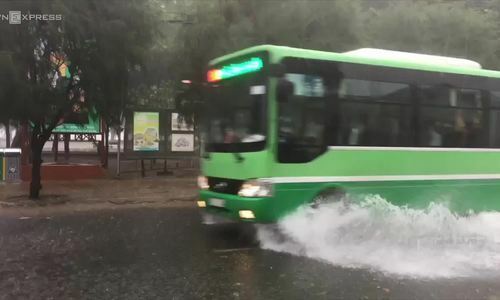 Heavy rains are lashing the southern beach town Vung Tau and Ho Chi Minh City's coastal area as storm Usagi weakens. 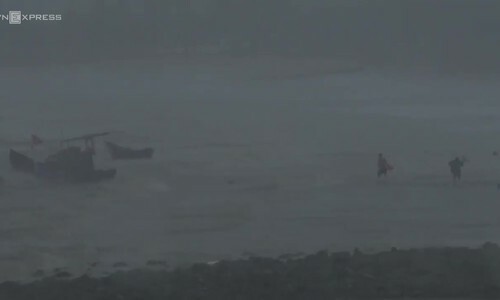 Sources from the Southern Hydrometeorological Center told VnExpress that the storm weakened at 11:20 a.m. as it entered the coast of Vung Tau. As of 1 p.m. on Sunday, the tropical depression was raging along the coast from the south central Binh Thuan Province to the southern Ben Tre Province, with maxium wind speeds of 60 kilometers per hour. It is forecast to continue moving inland before forming a low-pressure zone over the Cambodia border area at 1 a.m. Monday. Rains have been pouring down the popular beach town, uprooting trees, blowing off dozens of roofs and sinking boats along the coast. Several streets in Ba Ria-Vung Tau Province have been submerged under one meter of water. By Sunday noon, the tropical low has moved to the nearby Can Gio coastal district in Ho Chi Minh City. Le Minh Dung, vice chairman of Can Gio, said no damage and casualties have been reported so far. "But the weather will remain bad, so we have asked local residents to stay indoors to be safe," he said. Video below shows almost vacant streets in Can Gio as people stay away from heavy rains and strong winds. 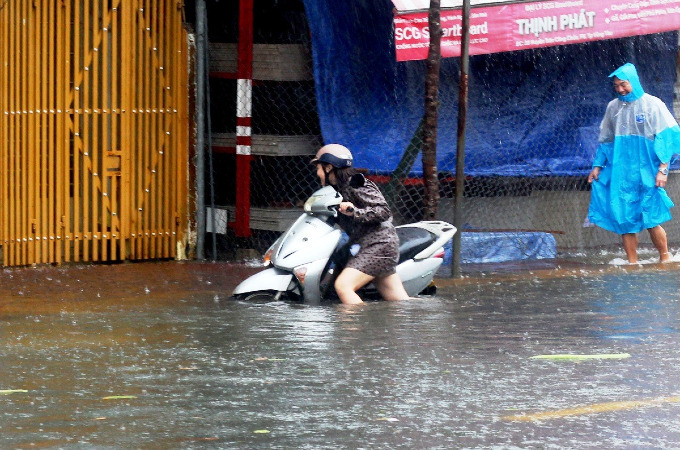 Southern provinces including Ba Ria-Vung Tau, Long An, Tien Giang, Ben Tre, Tra Vinh and Ho Chi Minh City will be battered by heavy downpours until at least Sunday night, Quyet said. Many places in HCMC should thunderstorms and rainfall of up to 200mm throughout Sunday. 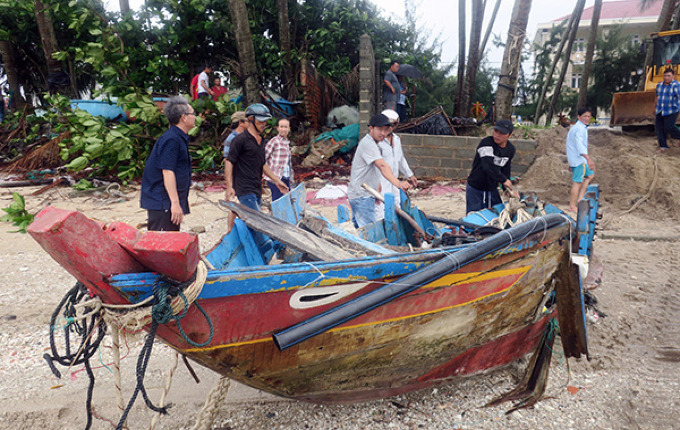 In the south central Binh Thuan Province, six hours west of HCMC, waves of up to four meters high have damaged at least 31 ships anchored along the coast. In the neighboring Ninh Thuan Province, erosion triggered by heavy rains damaged part of the North-South Railway on Saturday night and around 1,000 passengers had to wait to be transfered to other stations by cars. 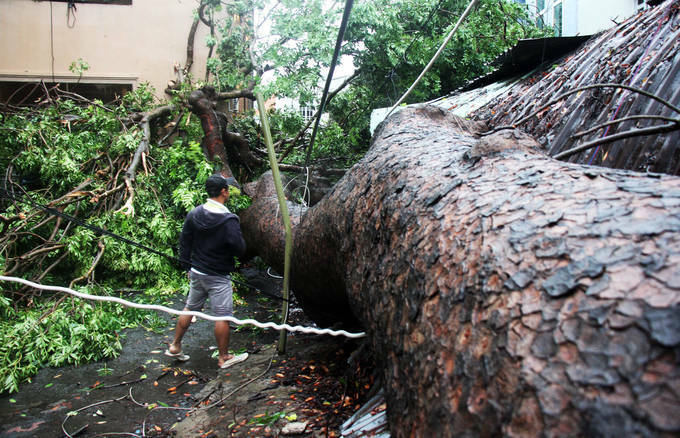 Storm Usagi comes a week after heavy rains from Typhoon Toraji triggered landslides that killed at least 20 people in the south central resort town Nha Trang. Weather forecasters in Vietnam have warned another four to six typhoons and tropical depressions could develop off the country's east coast from now until the end of the year. Half of them would make landfall in and batter Vietnam’s central region, they said. A record number of 16 tropical storms hit Vietnam last year, killing 389 people and injuring 668 others, mostly in the northern and central regions. The General Statistics Office estimated damage at around VND60 trillion ($2.64 billion), 1.5 times the previous year’s figure. In the first 10 months of this year natural disasters left 185 people dead or missing and injured 134 others, and caused losses of more than VND8.8 trillion ($381 million).